There was a wee hiatus on the Australian Exhibition Tour and the arts community in Wangaratta has stepped up to fill it! It's a Rural City with an extraordinary history .. gold and gem mining, largest wool mill at the time and of course close links with the Aboriginal population. It also has a quilted artwork that captures the imagination of any diaspora wanderer. 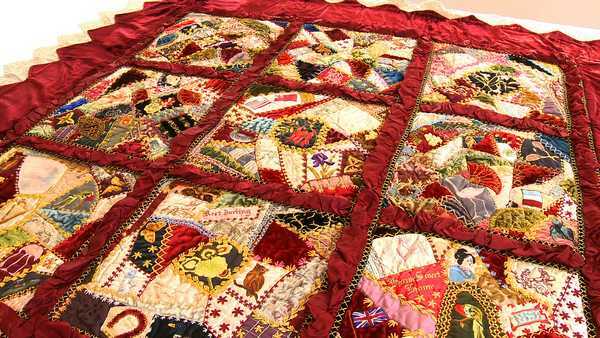 It's the Heritage Listed Marianne Gibson Quilt; the world's finest example of a crazy patchwork quilt made by a local woman Marianne Gibson between 1891-1896. It incorporates the story of the times and styles of the late 1800s. Amongst many finely embroidered motifs featured are local flora & fauna, Asian, European and North American influenced designs. 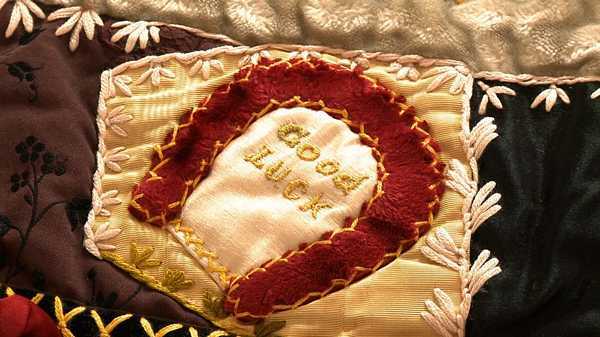 It was gifted to the Wangaratta Historical Society in 1976 by Alma Gard, a housekeeper for the Gibson's who was given the quilt by Marianne's daughters. It is kept in a special temperature controlled atmospheric room in the Wangaratta Art Gallery.